Sieve together maida, baking powder and baking soda twice. Keep it aside. Dust or mix tutti frutti with a little maida. This is done so that the tutti frutti does not go and settle at the bottom of the cake. Grease the baking tray with a little butter and dust flour/maida. If you are going to make cupcakes, grease and dust the cupcake moulds or line the cupcake moulds with cupcake liners. Beat butter and sugar until creamy. Then add eggs and beat nicely. 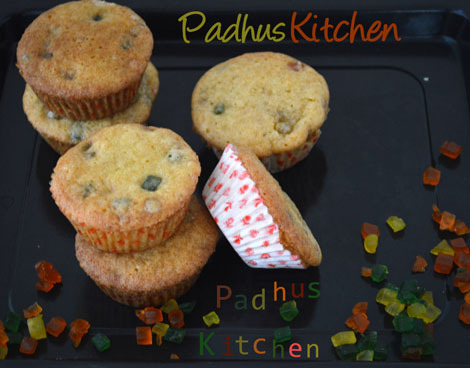 Pour the batter in a baking tray or cupcake moulds and tap the tray gently, so that the batter will spread evenly. Bake in a preheated oven for 25-30 minutes (180 degree C) or until a toothpick inserted in the center of the cake comes out clean. I got 6 cupcakes and a small square cake which I baked in a 4 inch square baking tray for the measurement above. Wow!! look at the picture of the soft and spongy cake below. Don't they look colorful and gorgeous. Note - If you want pineapple flavored cake, you can add 3 tbsp of pineapple juice instead of orange juice and a tsp of pineapple essence or vanilla essence.You can even use tropicana pineapple juice. A perfect cake for this festive season!Yum! delicious cake. stop by at my space too. hi sis.thanks for visiting my space.this is my fav and yummy. Loving those tutti frutti bites in cute cakes. They are soft & moist.. Yummy cupcakes.. I have a 9 inch round cake pan. Will be ok? Is cooking soda same as baking soda? Both are almost the same. You can use cooking soda or appam soda in place of baking soda. I have done that. 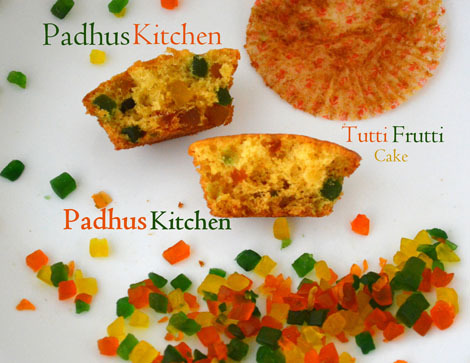 hi padhu,One thing I want to ask is for baking what you use...Can u pls suggest ..
Can I use almond , cashew, dried grape instead of tutti frutti? Is this necessary to add orange juice or pineapple juice? Vanilla essence is enough? Kala -It gives more flavor to the cake. You can skip and add little milk instead of orange juice but I recommend juice for this cake. Pls help me with the same cake recipe without egg. Thank you..
Hi..hw much does one cup measure? Hi , can we use oil instead of butter , if so what is d quantity.